Joan B. Grandt, 88, of Galesville, died on Friday June 1, 2018 at her home. She was born on June 16, 1929 in Woodstock IL to Stanley and Georgi Ann (Schinerer) Houda. She married Ray Grandt on September 16, 1951. Joan lover her time at their lake house. 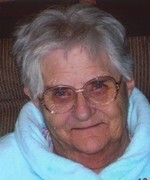 She loved the outdoors, fishing and Nascar. Joan is survived by, a daughter Stephanie (Edgar, Jr. M.D.) Goldston of Heber City, Utah; a son Ray, Jr. (Christi) of Onalaska; Five grandchildren: Ray Grandt III, Stan, Tony Kelly and Lisa; 13 great-grandchildren. Private family services will be held. Online condolences may be left at www.fossumfuneralhome.com. To send flowers to the family of Joan Barbara Grandt (Houda), please visit our Heartfelt Sympathies Store.